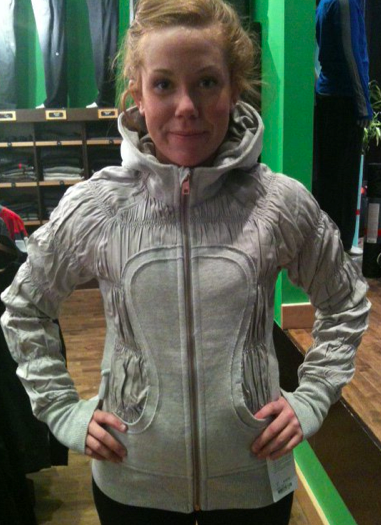 I just came back from Coquitlam Centre Lululemon and had a chance to check out this Special Edition Scuba Hoodie in Heathered Dune. I would probably never wear this one myself but there was something about it I quite liked in the Heathered Dune. It looks almost like a muted gold and has a metal (yuck!) zipper in copper. It’s a very showy and lux scuba hoodie that I may have actually been tempted to try in had it not had a metal zipper and if the price hadn’t been $138. I liked the copper color of the zipper with the gold Dune colored Tencil but the metal zippers are deal breakers for me. Interesting Scuba but perhaps too interesting for long term use. **Nope, after seeing more pictures of this scuba I’m not liking it. Interesting idea but back to the drawing board.